Life is just a box of ammo. Although director Mel Gibson's "Hacksaw Ridge" includes extensive and graphic blood-and-guts war scenes that rival "Saving Private Ryan" (or even "The Walking Dead") for their shockingly gory realism, the events leading up to the hellish title battle are Hollywood hokey, and the main character of this true story is embarrassingly unconvincing. 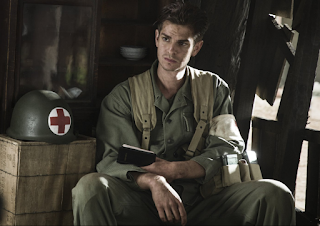 Andrew Garfield lays on what’s apparently supposed to be Forrest Gumpish dumbbell charm and a hick accent so thickly that he seems borderline retarded as Desmond Doss, a Virginia hillbilly who goes all moony for local nurse Dorothy Schutte (Teresa Palmer). Why the lovely, sensible and considerably more emotionally mature Dorothy would romantically reciprocate dopey Desmond’s desire is indecipherable, but maybe the heart wants what the heart wants. The movie’s gimmick is that World War II inspires Desmond to enlist in the army, but as a conscientious objector who won’t so much as touch a rifle. That’s because his father (Hugo Weaving, overacting shamelessly) was a violent alcoholic who once threatened Desmond’s mother with a handgun in their living room. What stopped him from decorating the wallpaper with mom’s brains was Desmond grabbing said gun and threatening dad with it, which would seem to make the point that a weapon in the right hands is a good thing. Reaching that logical conclusion apparently is beyond Desmond’s mental capacity, however. At boot camp, the belligerently stereotypical Sergeant Howell (Vince Vaughn) and barracks bullies make Desmond’s life hell, until he earns the grudging respect that those stock characters always eventually bestow upon the weak. Incredibly, however, we never see a single heart-to-heart discussion between Desmond and anyone else about whether his holier-than-thou stance really means that he would sit by and watch one of his fellow soldiers get shot, instead of troubling himself to shoot a would-be killer. Similarly, during the relentless hours of the Hacksaw Ridge battle against the Japanese on Okinawa that’s depicted in the movie’s second half, we never see Desmond in a single situation where he would be forced to decide between staying true to his beliefs or saving a life by taking up arms. It defies credibility to think that such a situation never occurred in the free-fire frenzy of all that fighting. By never showing Desmond faced with such a choice, his pacifism is never tested by a situation that would make it morally meaningful. Desmond shows inspiring heroism by remaining behind to drag wounded soldiers to safety instead of retreating with the rest of the able-bodied when US troops are about to be overrun. His courage deserves all of the respect and praise he received, and it’s nice to see footage of the real Desmond Doss near the movie’s end. It’s just too bad that this movie doesn’t convey more convincing humanity behind the hero. Postscript (11/4/16): It turns out that just about everything important in the weak first half of "Hacksaw Ridge" is fiction. The real Desmond Doss was drafted (didn't enlist); did not save his mother from being shot by his father (it was his mother who saved her brother); and met his wife in church (not at a hospital). Incredibly, though, what he did on Okinawa was even more impressive than what is shown onscreen. Click for more info: History Vs. Hollywood "Hacksaw Ridge" Story.